Over 20 percent of Libya’s primary health care facilities and 17 percent of its hospitals remain closed, a survey by the World Health Organisation (WHO) and Ministry of Health has found. Nearly nine percent of other specific service facilities are also closed and there is an imbalance of health workers and shortages of medicines, equipment and diagnostic apparatus, the report says. It did, however, note that the density of workforce and maternity beds was at an acceptable level, although service availability was not. 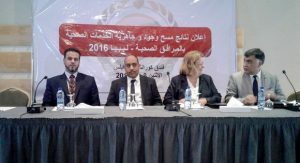 The findings were revealed at a workshop at the Corinthia Hotel in Tripoli chaired by Dr Omer Basher Altaher, the health minister in the Presidency Coucnil’s government of national accord. It was attended by officials from the health and eduction ministries, the social affairs bureau and a number of other organisations. Also in attendance was Dr Syed Jaffar Hussain, WHO representative and UN deputy special envoy Maria Ribeiro. The figures are far more positive than generally believed. The Libya health service is perceived as deeply broken. Several hospitals in Benghazi remain closed (although the Hawari Hospital is in the process of being reactivated); Misrata’s main hospital remains unfinished; hospitals in the south are without staff, medical equipment, medications and money; and medical facilities in Tripoli are dismissed as inadequate and incompetent. Those who can afford it head to Tunisia, Turkey or Jordan for treatment.